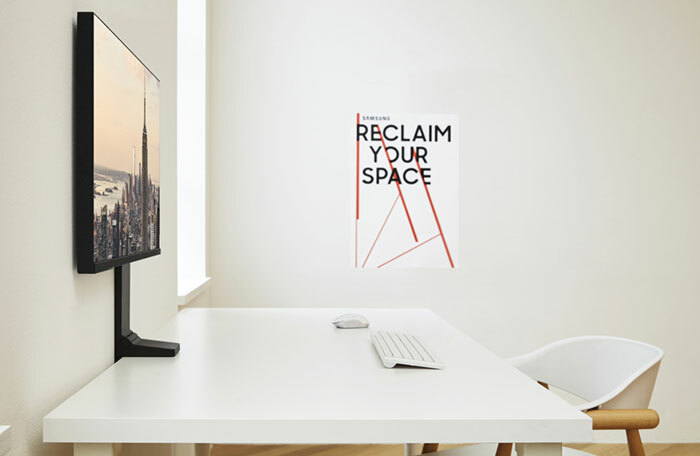 Just a little ahead of CES 2019 and Samsung has started to reveal some impressive new monitors, which we will learn more about when the show starts (Samsung is at CES booth #15006 from 8-11th January). 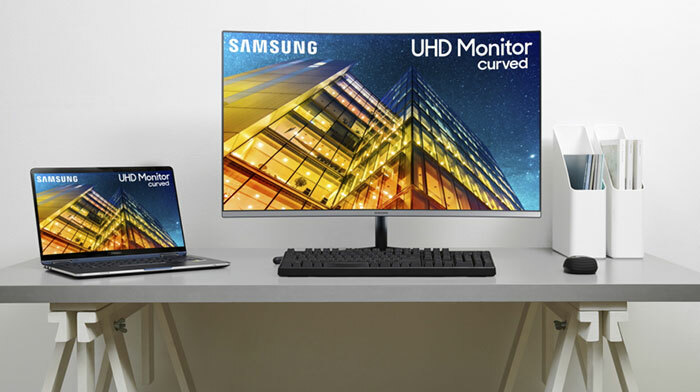 Via its dedicated news blog Samsung has just released outline details of three new monitors; the expansive CRG9 designed for gaming, the minimalist Space Monitor, and the UR59C 4K UHD curved monitor for content creators. 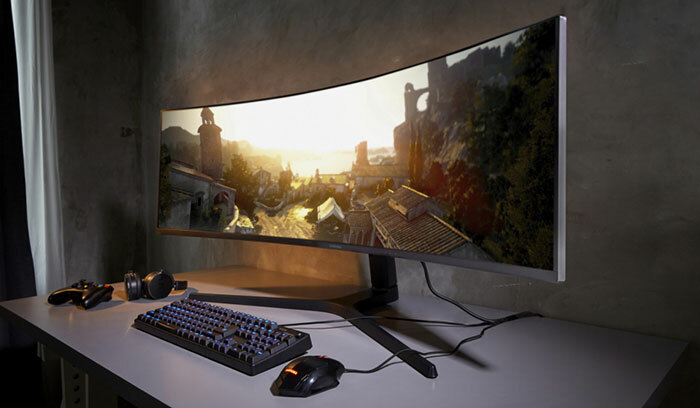 Samsung claims this is the world's first 32:9 aspect ratio gaming monitor. Its 49-inch screen is curved (1800R) and the panel used offers a dual QHD resolution (5120×1440) and HDR10 with a peak brightness of 1,000nits. Quantum Dot Technology is used for bright, rich colour reproduction. The 49-inch panel is equivalent to two 27-inch QHD 16:9 monitors placed side-by-side, says Samsung. To make the most of this expansive screen area Samsung has included dual-input PBP tech. On the topic of connectivity, the CRG9 includes one HDMI port, two Display Ports, USB 3.0 and headphone out. Gaming is the intended headline purpose of the CRG9 and Samsung boasts the display features good gaming specs such as a 4ms response time, up to 120Hz refresh rate, FreeSync 2 compatibility, and low image lag and motion blur - to help with fast paced games. Rather than me describe the design of these utilitarian monitors, please just check out the imagery below. 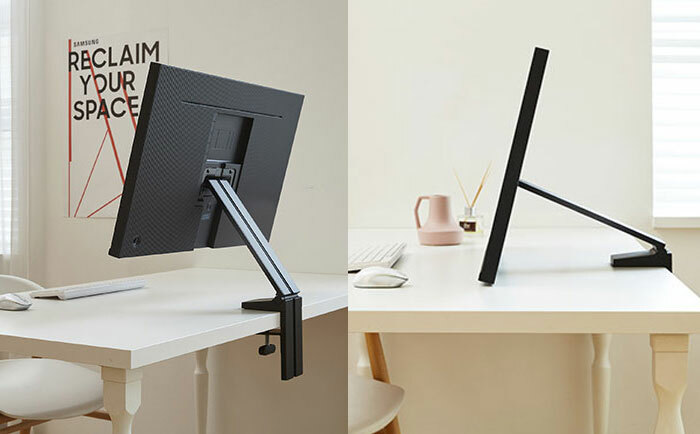 The mounting arm you see is adjustable, allows for easy ergonomic adjustment and clamps to the desk. Of course Samsung has put all the necessary ports and power connectors around the edges to facilitate pushing this unit flat against the wall, if you so wish. At the other extreme, the monitor can be brought all the way down to the desk level and tilted. To facilitate tidy cable management the power and data cables rout through the stand. Samsung will be selling at least two versions of its Space Monitor. One will be 27-inches in diagonal with a QHD screen, the other 32-inch model employs a 4K panel. 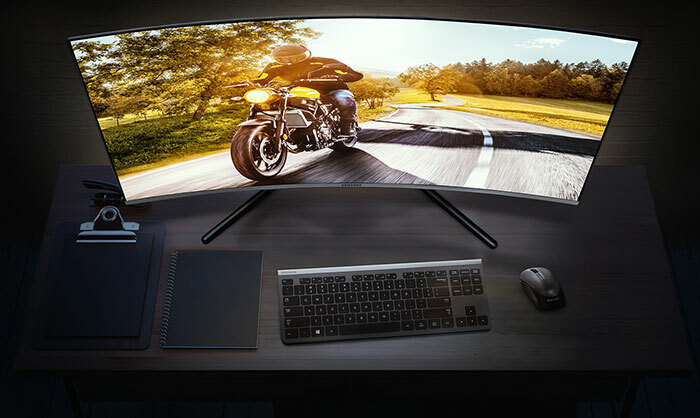 Samsung thinks its curved UR59C 32-inch monitor will appeal to content creators. The panel has a curvature of 1500R (smaller radius number = more curvy monitor). This is a 4K (3840×2160 pixels) monitor with a 2,500:1 contrast ratio and support for 1 billion colours. Oddly, Samsung doesn't even briefly mention the panel tech or colour output metrics for this content creator monitor. The UR59C has a super slim design, the screen is just 6.7mm thick, and it is 3-sided 'bezel-less'. Samsung has backed the monitor with a fabric textured casing and it is finished in a dark blue-grey. A slender metal stand though which cables are routed is supplied. We don't have pricing or availability details for the above monitors at the time of writing. That info, and fully fledged tech specs (from official product pages) is likely to become available next week. CRG9 def going on my black friday very very short-list for this year: ticks all my boxes, can`t wait to see how it shakes out. edit: samsung already have two other 32:9 monitors, one released in july 2017, so they can`t claim that this is `the world`s first`. just so you know. I's really like a 49 inch version of that space saving design, with the game specs. That would be glorious. If the price for CRG9 has less than 4 digits, I am already impressed.